Mona Lisa was frozen in time as the brazen glass frame preserved every curve of her stature. She seemed unreal but yet she was an amazing work of art everyone wanted to witness. The Louvre was packed with tourists ready to take pictures of history. I stood astounded by how the Mona Lisa was more than just a simple art work but it was a timeless masterpiece. According to some sources it took sixteen years for Lenardo Da Vinci to complete the Mona Lisa. I realize in this moment a masterpiece is a respected work art that takes time. Just like the Mona Lisa is a respected work of art so is the creation of our lives. Our life is an unpredictable art that is shaped by the bruises, scars, bumps and cuts we accumulate along the way. However, we spend too much time replaying the past scenes of our life only to end up in living in a life we regret. If we can truly understand the blemishes on our canvas were apart of the fundamental development of our life masterpiece. In order to see our lives as a masterpiece we have to be willing to readjust our visual lens. In order to readjust the visual lens you have to see every life happening as opportunity not a regret. Below are five tips you can realign your vision, erase the regrets & embrace your masterpiece life! 1) Let go of the past. The past is the past which cannot be changed so embrace your mistakes & realize that your past has shaped a better you. 2) Think about the lesson. We sometimes regret the choices we have made only wishing our life could have turned out different. But there were lessons to be learned from our mishaps. 3) Your life is a masterpiece. Your individual story is a masterpiece to inspire someone else. 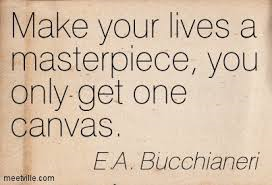 4) Your masterpiece is authentic. No person can live the life that was ordained for you . And most of all your life challenges were meant to help you grow into your true self. 5) Take a chance. If you never are willing to take a chance then you will always regret the choices or opportunities you did not take. Living in regret is a terrible mindset which keeps you from achieving greater things and living in the now! So, realign your vision, let the regrets go & cherish the masterpiece of your life!